on the other side, the liabilities it has towards its long-term providers of finance and short-term creditors. 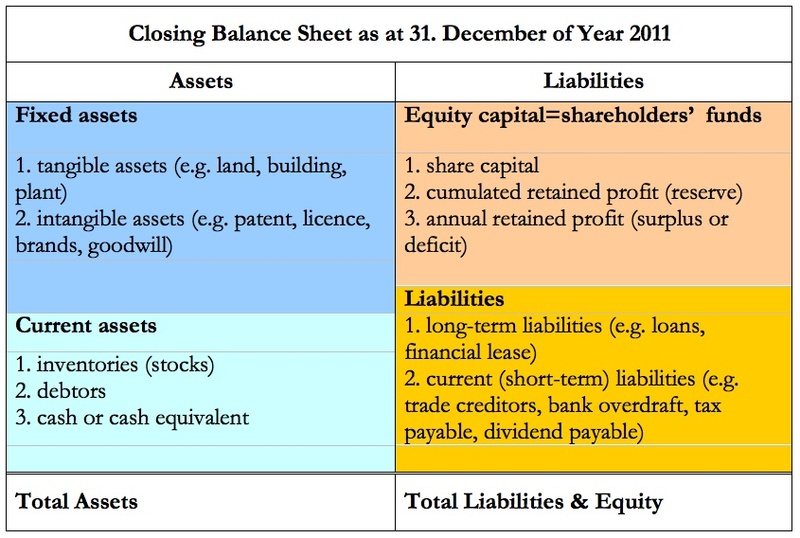 As the Balance Sheet shows how the liabilities and shareholder equity have been used to invest in assets, it should be no surprise that the Balance Sheet always balances: the total assets value must be equal to the sum of the liabilities plus equity. From the Balance Sheet, liquidity and stability ratios can be derived and provide an indication of the company’s ability to serve its short-term and long-term debts. This will be of particular interest to debt-holders like banks financing the business via loans, but also suppliers to evaluate the risk of doing business with this company. For business planning purposes, and as long as we are not trying to answer how the business will be financed, the Balance Sheet is optional, so that we can focus on profit and cashflows. However, if a business valuation has to be prepared using the EVA® (Economic Value Added) approach, then key financial ratios such as the ROIC (Return On Invested Capital) must be calculated, which will require a Balance Sheet forecast, or a least an estimation of the net fixed assets as well as the working capital – the difference between inventories plus debtors and creditors – and their change over time. Note that the CF, P&L and BS statements are not fully independent. On the asset side of the Balance Sheet, changes between the opening and closing positions will reflect increases in fixed assets as a result of investments, additional depreciation falling due, increase in the cash balance during the period, and change in working capital. These are all items appearing in the CF statement as well as the P&L account.